This is a great coupon to print. Who doesn't love hot wings or some spiciness to your tacos. 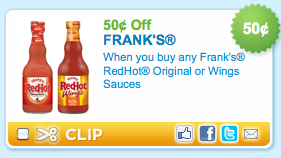 My store usually has the Franks RedHot sauce for $1 so when the coupon doubles it will be free.